I hope you enjoyed all the gender reveal photos I posted yesterday! 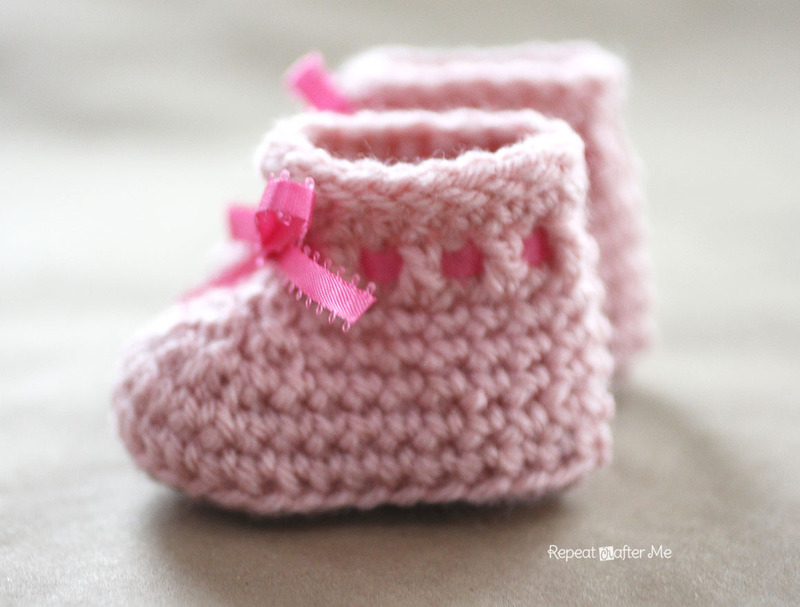 If you liked the baby booties in the photos then you are in luck because today I am posting the pattern! It should be a quick little pattern to work up and although I am calling them “newborn” baby booties, I think they could possibly fit up to 3 months depending on how loose you crochet. Also, the ribbon is adjustable and it can be tied tighter or looser. – Lion Brand Vanna’s Choice yarn. I used Vanna’s Choice Baby Yarn in Little Boy Blue and Vanna’s Choice Yarn in Pink. You can purchase their yarns HERE. SC Decrease = Single Crochet Decrease. I like to you use the invisible decrease as shown HERE. Chain 8, SC in second chain from hook and in next 5, make 4 SC in last stitch, now working on other side of chain, SC 7, join to first SC, ch 1. Round 11: slip stitch around, fasten off and weave in ends. Using ribbon (or a long crochet chain), weave in and out of the double crochet stitches. Tie in a bow in front! Note: The booties should take a nice shape, but I want to make you sure you know that I stuffed them with a kleenex so they would stand up pretty for the photo. Very sweet booties! Ah…a little girl. Pink is very fun! So cute! 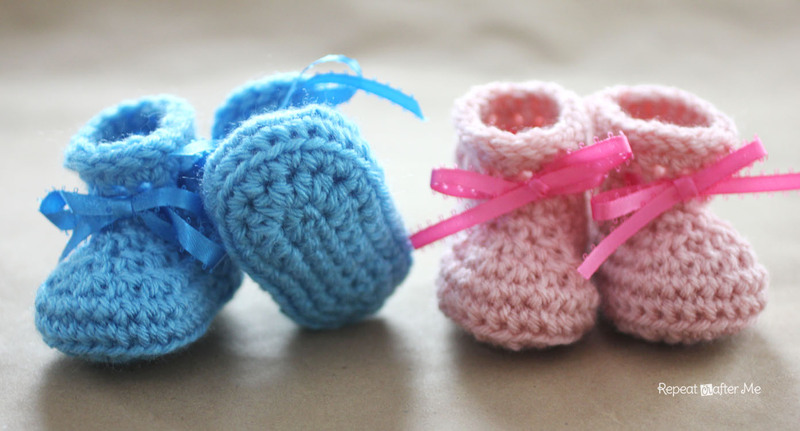 The little booties are absolutely adorable! Thank you for the pattern 😀 The booties are gorgeous. Hi there. After EACH round.. are you supposed to join and ch 1? love the patter, Going to try it today. Thank you! Hi! I'm kind of new to crochet. Do you count the chain 1 or chain 2 as your first stitch? I seem to be off one every row if I don't include the chains as the first stitch and do I join in the chain also? Would it work to put two stitches in the last stitch instead of the chain 1? Let's see if I can leave a comment 🙂 I need a little help – I have fudged my way through 5 pair – and am having the same problems every time I make them . . . .
Me too. I have had a lot of trouble keeping the stitch count right. I would have to add or decrease stitches to fix it. After about 6 times of frogging and starting over I finally gave up. I’m going to try a different booties pattern. Me too, something about this pattern is just not right. I have tried twice and am very disappointed. I am having the same issue with this pattern as I am with another bootie pattern. Each row is ending further and further down the side of the sole–I have a seam running diagonally to the right (I am left handed). This is causing all of the toe shaping to shift to the right and side. I am putting my first st of each row in the next st after the chain, like I would normally, and sl st to the first st.
Ok – (it wouldn't let me leave a comment yesterday). First, you are technically putting 5 sc at the end of the first step right? I can't get 7 SC on that side otherwise. ? Also, I am not ending up with the right amount of stitches at the end of a round – whether or not I start in the same stitch as the ch.1 or not. I love, LOVE LOVE these booties though – I am just struggling a little bit. Any help? The pair I just made I just did the 6 sc that would fit, and when I start the round I make the first stitch in the same stitch as the joining. I think they came out looking like Sarah's. I also only put the 4 sc in the last stitch. I hope this helps you. Hello, I just started making these booties and I'm having the same problem: 5 sc instead of 7.. Please, help me. I really want to make them. And I really need to make those to finish the outfit for my baby boy. So please help us since we are rather desperate! I ok had a question bout the 7sc on the back side of the start chain. I can easily get the six sc, but I runout of room for the 7th sc. I have been putting it into the skipped stitch from the from front side. Is that right? Either way they are adorable! Gotta find some cute ribbons for them. I love your patterns and certainly appreciate all the time and effort you put into giving them to us free! Very generous! Hope the pregnancy is going well for you, congrats! That’s a genuinely impivssree answer. CONGRATS!! Yay for us too we get to try your patterns for free and now more girl patterns!! So excited for you! Thank you!! When I join and add a chain 1 at the end of a row, adds stitches each time. I think that might be the problem others are having. I had to start counting the chain 1 stitch as the first stitch in the row. I kind of had to fudge the back of the booties to make them come out even because of the join slip stitch and the chain 1 adding two stitches to each row. If I only sc 6 in the second half of R1, my stitch count works for all rounds, but the end product is skewed. Am I missing something? I'm having some issues as well. I'm wondering if when you start each round you should be putting your first stitch into the same space as the chain or not!? Thanks. Just finished making a pair, at first I followed your instructions exactly, and I liked them but I decided to put in some flair of my own. when I reached the dc stitches I made them on alternating posts (one in front, one in back) all the way around to make threading the ribbon a little easier. I also didn't have the size hook you recommended so I used one size smaller, which I'm sure is going to be a tight fit on my baby when they arrive but I only need them for one picture, so I figured it would be ok. The only other change I made to them is instead of making slip stitches on the top row I did a reverse double crochet which gave it a fun sort of braided look. Oh I forgot to mention I'm going to try posting some pictures of what I've got on my blog and you can come see them if you like… http://www.mommymommymommywhat.blogspot.com though it may take me a little bit to get them on the page cause I have to look up all the patterns to be sure everyone gets credit for the patterns they offered. 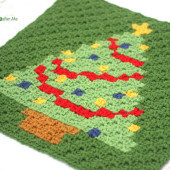 I'm very new to crochet, and would love some advice on how I can adjust this pattern to come out at a NB size, using 8ply (DK) as 10ply (worsted) is incredibly hard to come by in NZ. I have a ball of yarn (8ply) left over from a cardigan pattern my mum knitted for baby #2 due in just over 2 weeks. I'd love to crochet some booties that match the cardigan before he arrives! Soooo cute. I love all your projects!! I took that to mean doing sc2tog 6 times. HTH! I've just made one of the two botties! And I love it! I used a milky pink cotton yarn, and a green crochet chain! Looking awesome! Thanks for sharing the pattern! i have a question… how would you do it to be a little bigger for a 4 month old baby boy ? For those of you that were having problems completing the pattern try this: to get the 7th SC in the back side of the chain in Rnd 1, use the skipped stitch from the first side of the chain and then join in the next SC. When joining at the end of the next rounds, skip over the slip stitch AND the chain of the previous round and join in the next stitch (should be a SC, not a slip stitch or a chain stitch). When starting your next round, begin the round in the same SC that you joined in. Doing these things helped me get the perfectly uncrooked booties in the picture above 🙂 HTH! 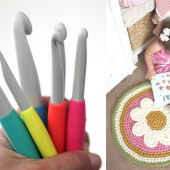 I can't wait to try this for my baby girl (coming soon)! I have enjoyed so so many of your patterns. They're fun, accurate, and easy to repeat. Perfect! These turned out so cute. Thanks for sharing your pattern! To those of you having problems with rnd 1, to me it should read: sc in second ch from hook and in next 5 ch, 5 sc in last ch, working down opposite side of ch sc in next 6 ch, (the last sc is in the same ch as the first sc), join with slst to first sc. (17 sc). That's how I figured it out and the rest of the pattern works out great. Hi Sarah, they looks very cute, i want to make the booties for 3 to 6 months baby girl, can you please help to choose the hook size. Thank you very much. Perfect pattern! My new favorite. I have been searching for a NB bootie pattern that I liked and I have finally found it. Thanks! After several attempts and a lot of yarn ripping.. I finally got it. Join with ss in the first sc of each round. Ch 1 and make first stitch of next round into the same space as the ss and ch 1. So. . For example. .You are finishing rnd 2. You do 2 sc into the last two stitches , then you join with a ss into the first sc of rnd 2. Ch 1, and do a sc into that same stitch. This counts as the first sc in the group of ten single crochets from round 3. Continue like this for the entire pattern and they turn out perfect. Hopefully this will help someone. 🙂 I love this pattern btw! Thank you for sharing. Hugs! Thank you so much! This saved my skin! Could this pattern be adjusted for Premies? Also need to say that I didn't mean that in a "snippy" way AT ALL. I'm sure she's busy as all get out with 3 little ones. Thanks again crafters! Brianna's suggestion works beautifully! Good luck! I'm working the pattern for the Hello Kitty crochet newborn shoes. I've worked the rounds ending round 8 having 18 sc to work on. I skipped to row (round) 9 for left shoe but found the instructions confusing. I followed the pattern, but don't understand where the "next 23 sts" come from as there were only 18 sc to start with. To me if I had to count to 5 to start the strap that would leave me with 13 sc. Has anyone else had this problem? All of mine are coming out slanted! Can anyone help me fix this? Love the bootie pattern. I have made 20 so far for a local charity. Cute and quick . When I decrease on rows 6, 7 & 8 (sc decrease) the bootie appears holey on front….what am I doing wrong? Try doing the decreases in the front loop only. That will eliminate the holey look. Can you give me the pattern to make this for a toddler…2-3 years old? Finally a pattern that I can do right! Love your blog! I have made several of your patterns. Keep up the good work! I would be ever so grateful for a video tutorial. I am new to crochet and reading patterns is my weakness. These booties look very similar to the ones my grandma would make. I would sure love to be able to make some. 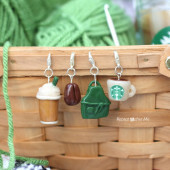 Sarah, these are adorable and I couldn’t wait to make them! Only 11 rows! I am so grateful that you are willing to share this pattern with us. Thank you so much! Now I must look through your site to see what other goodies await. How would we increase stitches to make bigger sizes? Thank you, this is an easy and great pattern for booties. I made the pink ones and they are adorable. I love your work and I refer to your site all the time. I hate sites which offer comment sections as it (mis)leads one to believe that the poster is actually going to respond…… Round one UTTERLY confusing. Forget this crappliy written pattern and onto the next. I made a pair of these and gave them to a friend at her baby shower. She loved them. I also got another friend who is wanting a pair for her newborn who will arrive soon. She paid me for hers. I would never post this pattern or any pattern as my own. 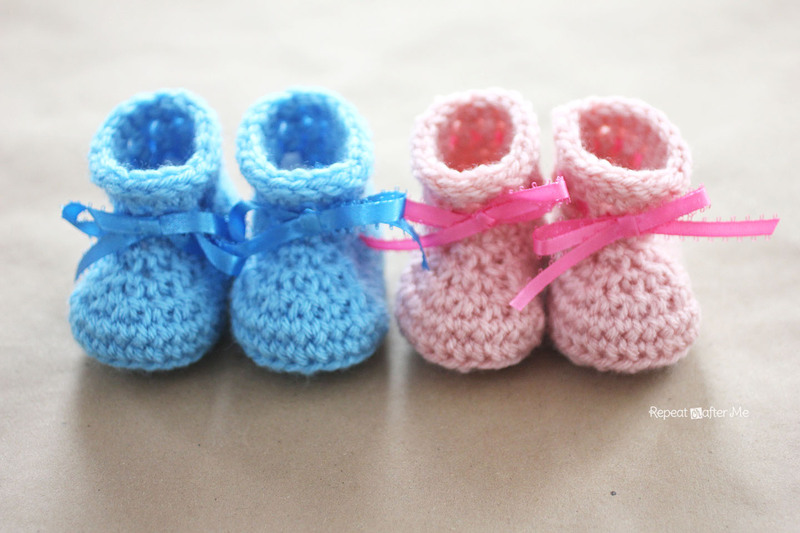 Thank you very much for your free pattern, I’ll be making these for my 7th grand child due in Nov.. I’ve already made thread crochet pink and white sandels for a girl now for a boy’s pair!! Thank you for the free pasterns, I do appreciate that when you say free it is so. Some other places offer free patterns but one can NEVER get them to save or print. I love these booties but I must be missing something. At the end of round 5, I have the 32 sc. Then when I do the decreases, I have stitches left over. I do 10 sc, the 6 dec., and 10 more sc but it doesn’t come out right. What am I doing Wrong? I did my decreases like 2 sc tog. Thanks for any help. I love all the patterns. I made them and they turned out sooooo cute. Unfortunately, I am a tight crocheter and my son was born with huge feet. They never fit! 🙁 Do you have a suggestion of how I can modify the pattern for a size up? 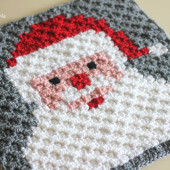 Hi I know this is an old pattern but I was wondering how you can make them bigger! My LO is 5 months! Thanks! I saw that you posted this yesterday so wondered if you have made these booties already. I’m having trouble as front of where toes will be is slightly off to one side. I saw another lady saying hers was too. What could I be doing wrong ? Did you follow the pattern as written or by a comment that a lady stated as she put 6 sc into starting chain on round 1 instead of 7 sc ? I hope this makes sense. Thank you. Its very pretty! So cute! Cant wait to try this out!! Love these booties but having done one it seems to hold a shape for a right foot? Will there be a pattern to follow for the left? Does it make a difference if I use worsted weight? I love the baby bootie pattern…I have made two pairs using variegated yarn…they work up great and so fast…this is the first time I have ever made baby booties…thank you for a easy and great patternto make.